So let's talk more about this episode and the three different plots that intersected this week, shall we? First off, this episode was penned by my favorite New Girl writing duo (also former Community writing duo) Matt Fusfeld and Alex Cuthbertson. I always love their episodes because they tend to be a bit lower on the hijinks scale and more character-focused. I really enjoyed "The Right Thing" because it gave us so much hilarious material to work with and so many wonderful factions of the group. So great job, both of you on that. "The Right Thing" finds Jess miffed that a guy Coach set her up with named Pete isn't texting her back. And so, she and Cece decide that since the guy is clearly blowing her off, they'll confront him. They do and... find out Pete died. Which would explain the whole not-texting-back thing. Jess decides that the right thing to do would be to attend his funeral, which Coach and Cece are vehemently against. They don't need to do that because they weren't ever really friends with Pete. It's not their responsibility. But Jess claims that it's the right thing to do. And I love Jessica Day because she feels such immense guilt and responsibility over everything in life that it causes her to be the most empathetic person she can be. She often feels responsibility for things that aren't even her fault or that she should feel a burden to do or accomplish. That's who Jessica Day is, really. She clings to the idea of doing the right thing because if she does, perhaps others will too. And maybe the world will be better as a result. Unfortunately for Jess, Coach, and Cece, there are very few people at the funeral for Pete and one of those people is Pete's girlfriend. Uh-oh. So, of course, instead of coming clean about who she really is... Jess lies. She lies because she wants to protect Pete's girlfriend, a woman she doesn't know, because she was texting her boyfriend. Jess feels guilt and so in order to absolve the guilt she feels, she decides that she needs to stay at the funeral. Cece eventually ducks out and goes to get a pedicure (then inadvertently talks to Schmidt's mom and it's the best thing ever), while Coach keeps trying to tell Jess that LYING cannot be the right thing to do. No matter how she spins it, lying about who she is? It's wrong. In fact, coming to the funeral at all is wrong because there was no reason for them to attend. So Coach, too, prepares to head out the door... until JJ Watt shows up and Coach lies about who he is in order to get in good with the football star. The moral of the A-story in "The Right Thing" is this: sometimes doing the right thing means doing what's best for you. It means not having to save everyone or make everyone happy. Jess's desire to "do the right thing" was stemmed from a burden of compassion and turned into a messy web of lies so that by the time she left the funeral (with everyone figuring out that she was "sexting" Pete), she wasn't even remotely close to doing the morally right thing. Jess is never going to change who she is, fundamentally, and that's okay. She'll never stop wanting people to approve of her. She'll never stop wanting to be everyone's friend (as we see at the end of the episode with Schmidt's mom). She just won't. She'll never stop wanting to do the right thing simply because it is the RIGHT thing. But I think this episode helped her to realize, even slightly, that sometimes doing the right thing means doing nothing. And that if you try to carry around the burdens of everyone else, eventually you'll collapse under the weight of it all and probably end up doing the exact wrong thing. Meanwhile, in our B-story, Schmidt's mom comes to town and the man is apprehensive because... well, Schmidt's mother is controlling and demanding and nothing that Schmidt does is ever right. Sometimes I wonder why Schmidt has such terrible self-esteem and then I remember how he was raised and think that it seems pretty accurate for him to crave the approval of others. It makes sense that Schmidt is a womanizer in the early seasons of the show and that he always tries to be better than everyone else. It makes sense that he wants to be successful because that's what he equates with love. Schmidt and Nick have been best friends for a long time, so Nick knows how Schmidt's mother can be and yet... Nick continues to do whatever it takes to help his friend out. He sees how absurd Schmidt's mother is, but that doesn't stop him from writing out bar mitzvah thank you cards in this episode. In fact, Nick Miller is pretty wonderful in "The Right Thing." When Mike announces that he's selling his shares of the bar, Nick decides that he and Schmidt should purchase them. The only problem is that they're short about $10,000 (even with the ten grand that they got from their failed swuit). Schmidt has a way to acquire the money but it requires asking his mom for his bar mitzvah funds. She agrees to give them to him... on one condition: he has to finish writing the thank you notes he started years ago. It's absurd and silly but it's her rule, so together, Nick, Schmidt, Winston, and Aly (more on them later) help Schmidt recall who gave him money and how much was given to him. When they present the notes to Schmidt's mom, however, she isn't impressed and requests that they change and add information. Here's the thing about Schmidt's relationship with his mother (and a nice parallel to our A-story): Schmidt constantly wants to please her. He can't ever, though, really make her happy and it's maddening for both him and Nick to witness. 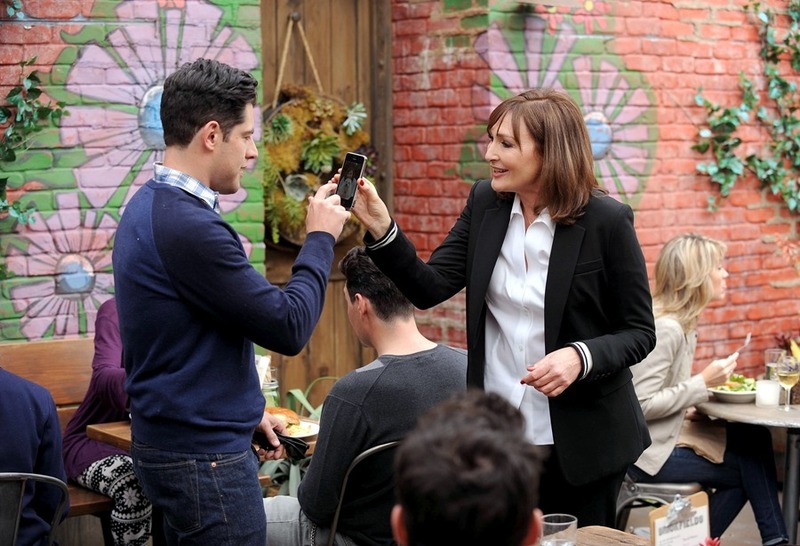 The final straw comes when Schmidt's mother dares to insult Nick and declares that he needs new friends. Schmidt, in a moment of awesomeness and bravery, stands up to his mom and tells him how great of a friend Nick has been. I love Schmidt and Nick's friendship. I seriously do. I've loved it for years and I love that this year, more than friends, Nick and Schmidt are partners. They've got each others' backs, no matter how silly or significant their obstacle is. Nick, without question, wrote out thank you cards for Schmidt. And he supports Schmidt, emotionally, too. It's easy to think of Nick as the screw-up or the one who doesn't have his life together. But then I'm reminded of episodes like "Tinfinity" and "Keaton" which prove that Nick has always and will always be there for his best friend. Nick may not have his life together, but he certainly knows how to make Schmidt a priority. It's lovely. Schmidt's mom realizes, after her son stands up to her and she talks to Cece at the nail salon, that she has to start letting go and seeing Schmidt as an adult. She can't make his life the way she wants it to be -- she can't mold him into a perfect son, because that means suppressing all of the things that make Schmidt who he is. So she agrees to give him the money and he and Nick buy 10% of the bar. Elsewhere in this episode, Winston tries desperately to become friends with Aly while they're not at work. When she shows up to help Schmidt remember who gave him money for his bar mitzvah and how much, she actually has an enjoyable time and Winston is confused (rightfully so) when she pushes him away. As it turns out, Aly tries to keep her distance from her partners because the last person she worked with fell in love with her. And Winston... well, all Winston wants EVER is for people to like him. So he assures her that he won't fall in love with her and it's this lovely little moment that the two have where they realize that they can be partners at work and friends off-duty. "The Right Thing" saw our favorite New Girl characters struggling to do what they thought was right -- listening to their parents or lying to spare someone's feelings or pursuing a friendship, etc. In the end, I think they realized that the right thing and the easy thing definitely aren't synonymous but that you can grow from those experiences. The most important thing is that you surround yourself with people who make you better and who encourage you to do what's right even when it's difficult. "No, that's like, a glorified selfie." "We get together and we laugh. She tells me all the ways that I could be better at things and then I do them, but not right. It's fun." "I was one of the last people to text him. On EARTH." "I got swindled by a young gay rollerskater." "Oh, so what? She's a typical Jewish mom? It's anti-Semetic when you say it that way." I loved Nasim Pedrad's reappearance. Can we get everyone from SNL to be on this show? I know Taran Killam will be on next season. "Can I get an alcohol?" Schmidt's bar mitzvah video and everyone interrogating him was PERFECT. WE ALMOST GOT TO HEAR SCHMIDT'S FIRST NAME. The boys called pop psychology both "popsicle psychology" and "popcorn psychology" in this episode and I have never loved them more. "I thought I saw Pete's ghost. It was a paint can." "I just think you'd be more of a success, socially, if you let people come to you." This season is just hitting it out of the park on a regular basis! I think that, looking back years from now, this season will contain some of my favourite episodes. This week's ep was great and the dialogue and interactions were wonderful. I think that Jess' need to be liked was very apparent this episode and I do love that about her. That trait also pushes her into uncomfortable or weird situations at times but it is part of what makes her so... Jess. I think her desire to go to the funeral and her desire to be friends with Schmidt's mum were coming from the same place. Even if the intimacy or familiarity is not present in a relationship yet Jess wants to fast-forward like it is already there. And when she admits to Coach that she doesn't even know what the "right thing" means anymore I thought that was a really great moment between the two of them. Max Greenfield totally killed me this episode. Every other minute he was doing something wonderful and hilarious. This cast is disgustingly talented. I loved meeting Schmidt's mum and seeing them interact. It was so great to see him regress into a little boy (cause we all do that a little around our family I think). I figure that Schmidt's mum gave him the rule about writing the thank you cards before getting the money all the way back when he was thirteen and I think that was a totally appropriate rule for a teenage boy. He's not gonna want to write thank you cards and until he says thank you he can't have the gifts. (I'm going to remember that rule for my little boy.) And I love that Nick was horrified that he hadn't written the cards. Awesome. Of course, an appropriate rule for a thirteen year old is somewhat ridiculous when applied to a man in his thirties. And when she criticized how they wrote the cards I could see the pattern of Schmidt's childhood. You can't expect someone to gain confidence and responsibility if nothing they do is ever good enough. Of course my 3 year old doesn't do dishes as well as I do. He loves to do it and if I nitpick at everything he does he won't be willing to do it anymore. I loved how a small little phrase from Cece convinced his mum to see things differently ("This is why strangers talk.") Their whole conversation was great. - "if it is a boat I'm going to be so psyched. I literally just got new boat shoes." - Jess and Cece's unison gasps and faces when they think Pete is blowing Jess off. Girl rage! - the sing song way Winston said "Just got out of the shower. Guess who cleaned everything"
- "or if you'd gone skiing together." Everyone seems to know the rule but Jess. What? - "Tape it down Miller." - "Put it on. That's very nice. Now take it off, you're in a restaurant." - The whole good cop/bad cop interrogation scene was priceless. "Yes! Love the dead ones." - "Hard candy?" "Is it butterscotch?" "No, cause we're friggin' strangers. Is it butterscotch" I love when Nick gets extra Chicago in his voice. - The whole speech about left over chili was amazing and his little swish out was everything! - "This is from that sixth grader over there." - "Don't nobody want your babies. Don't go fallin in love with me cause I'm lovable as hell." Yes you are Winston Bishop, yes you are. - "How bout Owen Wilson's nose?" - "You know what's fun? I'm not going to be able to sleep until we're best friends." 1) This season has been such a return to form. I can't even express how much I've loved it. It's gotten back to the root of who these people are and what makes them funny. I'm so sad that we only have a few episodes left with Damon because his character has been SO great this year. 2) YES to the Jess stuff. I love that the whole point of her story seemed to be that Jess will ALWAYS want people to like her. Her hilarious attempts to become friends with Schmidt's mom were perfect. 3) Max Greenfield deserves ALL of the awards for how hilarious he was in this week's episode. Every little twitch, from the moment he appeared on screen was just so perfect. And I loved how hilarious he was but also how he stood up to his mother for Nick. You can totally tell that Schmidt is the way he is BECAUSE of the childhood he had. EVERYTHING ABOUT MAMA SCHMIDT/CECE WAS PERFECT. I NEED MORE. Isn't Nasim Pedrad just SO perfect in this role? THAT BUTTERSCOTCH LINE. I didn't tweet it so I couldn't remember exactly how it went but bless you because that was amazing. So that was long but I just loved so much of that episode. It was well balanced between the various plot lines, the timing and flow was seamless, each character had something to contribute, so many wonderful lines and we got to see some more layers of characters we already know and love. Can't ask for much more than that. GURL. This whole season has been an impeccable balance of humor/heart/character development. I'm in love.